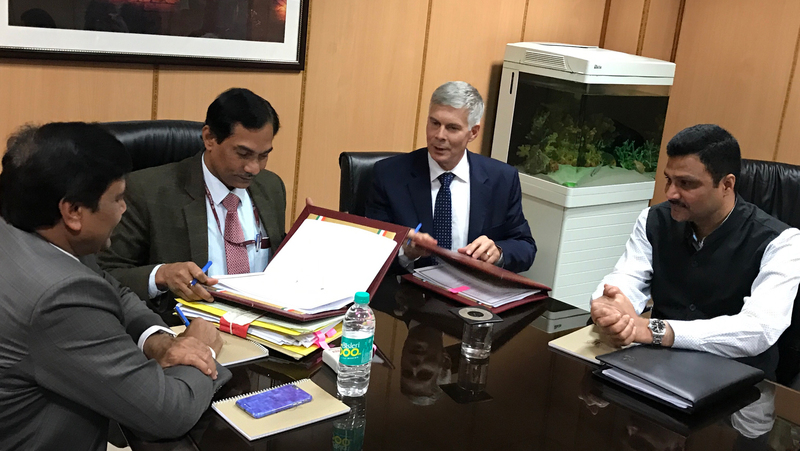 Dr Trilochan Mohapatra, Director General, ICAR with Dr David Bergvinson, Director General, ICRISAT (in the center) sign an agreement of collaboration between ICAR and ICRISAT on 15 March 2017. Also in the picture can be seen Mr C Roul, Additional Secretary, DARE and Secretary ICAR, Dr A K Padhee, Director, Country Relations, ICRISAT, and Dr S Sandhu, Deputy Director General, ICAR. New Delhi, India (16 March 2017) ― Climate smart crops, smart food and digitalization of breeding database are some of the core areas of research in a new agreement between the Indian Council of Agricultural Research (ICAR) and the International Crops Research Institute for the Semi-Arid Tropics (ICRISAT). Strengthening their partnership to benefit smallholder farmers in India and globally, the two organizations will continue to work together on crop improvement and agronomy programs for grain legumes and dryland cereals. During the discussions, Dr Trilochan Mohapatra, Director General of ICAR emphasized that the collaboration benefits Indian farmers and they are committed to achieve real impact through the partnership with continuous monitoring by both sides. Other areas of focus over the next three years include: Integrating systems modelling tools enabling informed decisions for upscaling climate resilient agriculture, developing genetic and genomic resources of finger millet and enhancing genetic gains for priority traits. “Dryland cereals and grain legumes are branded as Smart Foods – good for consumers, farmers and the planet as they diversify farming systems and help smallholder farmers adapt to climate change. 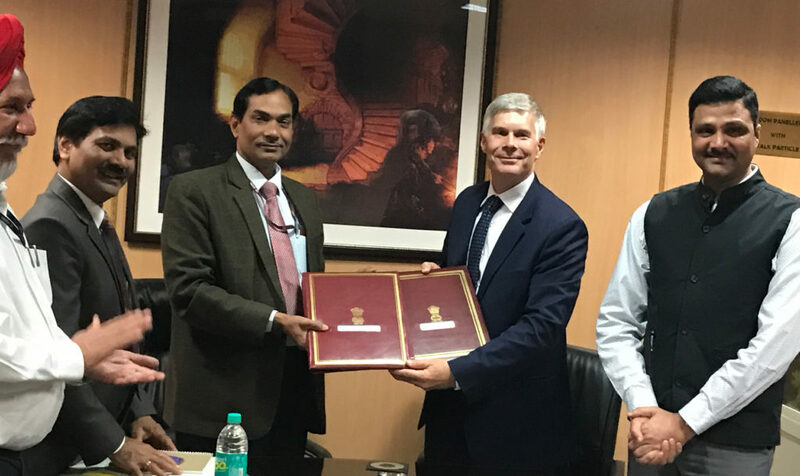 We enjoy a strong partnership with ICAR so we can deliver real results to improve the lives of farmers and their families in the harsh drylands,” said Dr David Bergvinson, Director General of ICRISAT at the signing of the agreement with Dr Mohapatra in New Delhi, India. A very successful example of the years of partnership between ICAR and ICRISAT that has had real impact, is the release of 42 improved and short duration varieties of chickpea. An important pulse across the country, ICAR-ICRISAT varieties now make up 53 per cent of top chickpea breeder seeds in India. The collaboration has also successfully developed a machine harvestable chickpea that has been released in Andhra Pradesh and Maharashtra states. This reduces harvesting time and drudgery for farmers, thus increasing their profits from the crop. In addition to setting the terms of the collaboration from 2016-2018 and the transfer of agricultural technologies between the two institutes, the partnership includes funding to research grain legumes and dryland cereals and support for the Smart Food initiative to deliver sustainable and nutritionally rich products to consumers. On the crop improvement front, the agreement will also facilitate research activities on transgenic pigeonpea and chickpea for insect resistance. Also present at the occasion were Mr C Roul, Additional Secretary, Department of Agricultural Research and Education (DARE) and Secretary, ICAR; Dr S Sandhu, Deputy Director General ICAR; and Dr Arvind K Padhee, Director Country Relations, ICRISAT. Both partners have a long history of cooperation to further crop improvement and technologies beneficial for farmers, and the new agreement is expected to allow the institutes to build on mutual strengths and expertise.